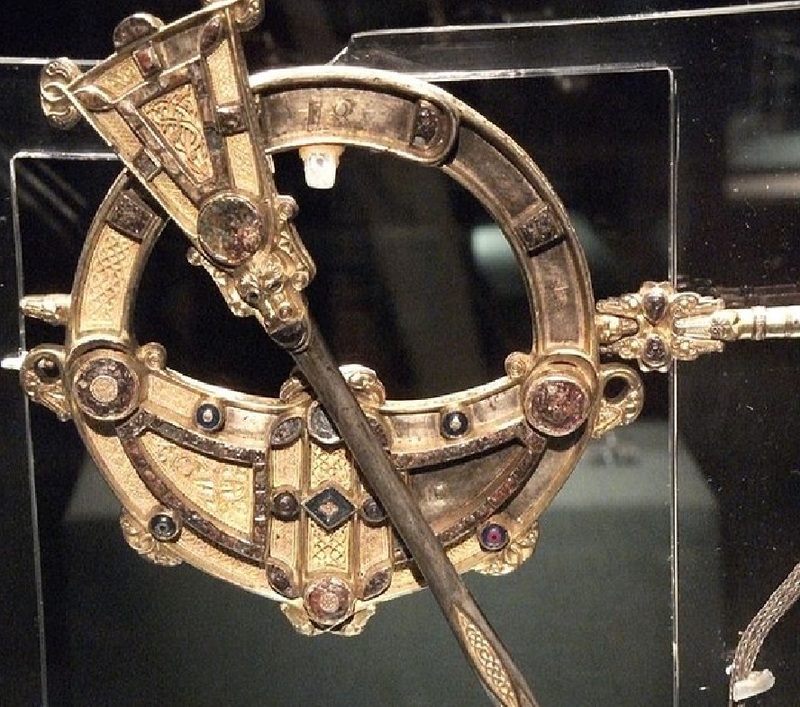 Ireland had a rich tradition of metal working which was added to by the introduction of Christianity. New artistic influences from Britain and Europe came to Ireland with the new religion. 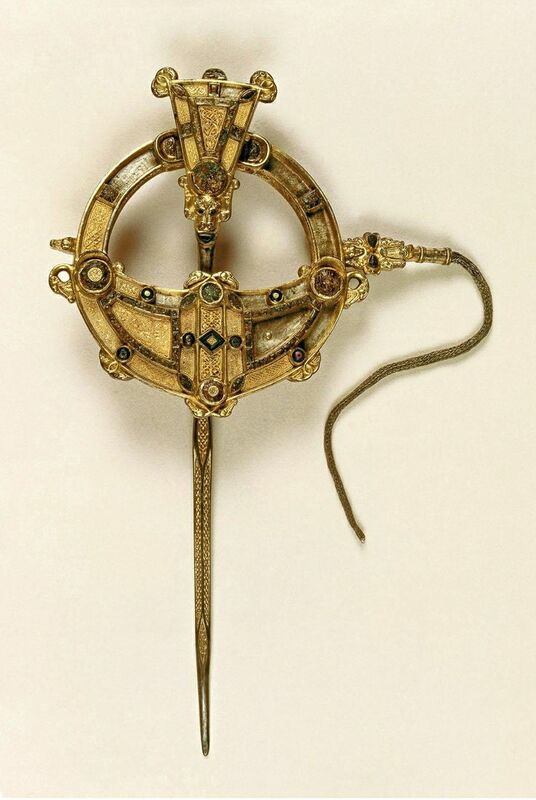 The Tara Brooch was found on a beach in Bettystown, Co Meath. It dates from the 8th Century AD. It is an Annular Brooch – this consists of a ring and a pin. It was used to fasten a cloak onto clothes. 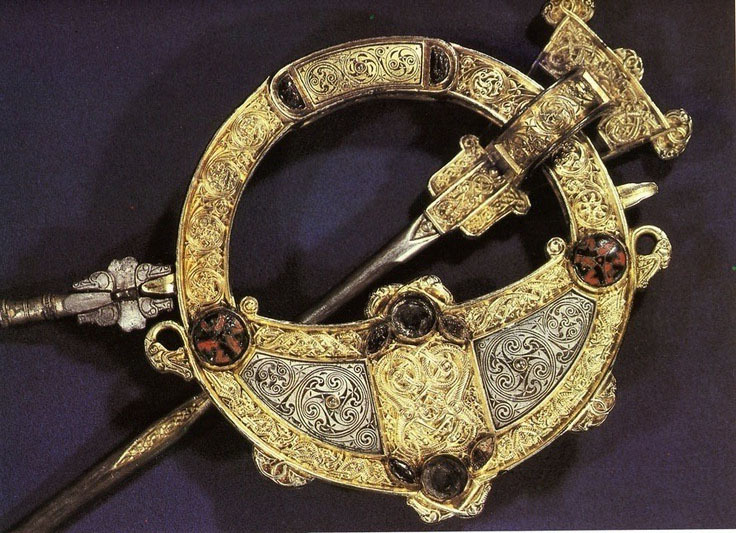 The brooch is made of silver which was cast and then gilt (covered with gold). The entire surface of the brooch – back and front – is elaborately decorated. (A) The front is ornamented with a series of extremely fine gold filigree panels depicting animal and abstract motifs that are separated by studs of glass, enamel and amber. These panels of filigree were soldered into position. Several of the panels are now missing. 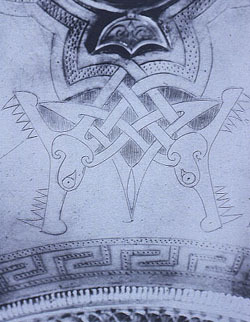 The style of the decoration of ornate interlace that found in the Book of Kells. (B) The back is better preserved than the front, probably because the decoration is cast and not filigree. The back is flatter than the front. The motifs consist of scrolls and spirals and is more similar to the La Tène decoration of the Iron Age than the Early Christian Style. (C)The pin of the brooch is also highly decorated with gold filigree panels and studs. A large animal head adorns the point where the pin head meets the needle. This head is highly stylised and consists of spirals for the skull and the snout. (D) A silver chain made of plaited silver wire is attached to the brooch by means of a swivel attachment. This swivel contains animal heads and two tiny cast glass human heads. 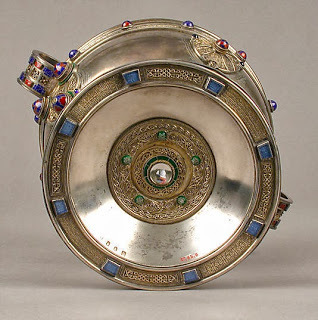 The Ardagh Chalice is one of the finest masterpieces of the Early Christian Church. It was found near Ardagh, Co Limerick in the 19th century by a boy digging potatoes. 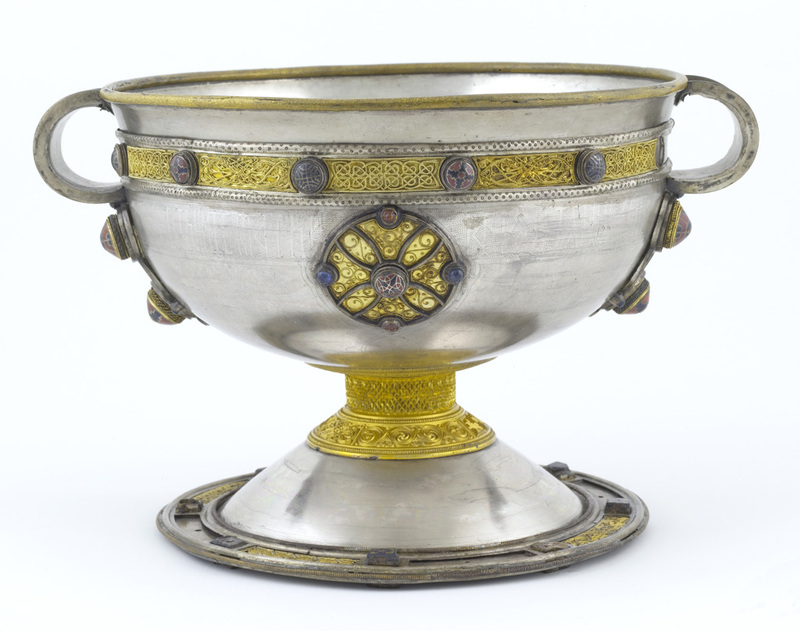 The Chalice dates to the 8th Century AD and it was used to hold wine during the mass ceremony. The shape of the Chalice was influenced by Roman tableware. The Chalice is composed of more than 250 seperate pieces – silver , gold, enamel, glass, amber and semi-precious stones. The bowl and the foot of the chalice are made of silver which was beaten into a rounded shape and then polished on a lathe. The bowl is attached to the stem and the foot by a bronze pin.The stem is made of cast gilt bronze alloy. 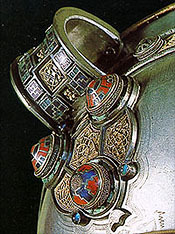 The outside of the Chalice was decoated with gold, silver, glass amber and enamel. There is a band of gold filigree and studs encircling the bowl. There are 12 studs and 12 panels ( 10 panel of filigree exist -two are now missing). Below this band, running around the entire bowl is an inscription of twelves names – the names of eleven apostles and St. Paul, ( Judas the twelfth Apostle is excluded). Museum historian Raghnall O’ Floinn believes that the repeated use of the number twelve is significant.Perhaps it is symbolic of of the 12 Apostles who shared the wine with Jesus at the last supper. On the cup are two large roundels with cross shaped designs – back and front. Below the two handles there is animal decoration Incised into the silver bowl. Inscribed aminal designs below the handles. The two handles have elaborate escutcheons which are decorated with complex glass studs and filigree panels. Escutcheon underneath the handle with three large studs and filigree inserts. 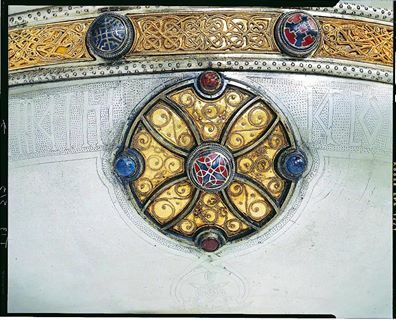 The underside of the Chalice was also highly decorated and contains a rock crystal at the centre.